I get this look from her alot! Dad and Erik getting ready for the big launch.. BLAST OFF!! By the way.. nice picture, Jaren!! For anyone who wants to see pictures of Jaren's 30th Birthday party, refer to our Jarrard blog, it was feeling lonely so I posted lots of pictures on it today! This was Carson and Jaren's first Cougar game experience... Jaren lasted, Carson didn't. Thanks mom, Dad,and Colette for making this possible! For Erik's B-day I took him on the Heber Creeper. He liked it. It was pretty fun. Here he is with a steam engine. I don't know the difference between train engines, but Erik does. This is an open air part of the train. I look cold, because I am. It was pretty though. This is the diesel engine. This is the one that pulled us. Doesn't Erik look so happy? I bet he hopes there are trains in heaven. YUM. This is Erik's cake i made him. If you can't tell that the candles spell out BYU, then you are not a true cougar. 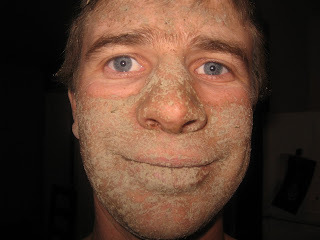 Hyrum came in from steaming off the beet harvester and took a picture of himself when he came in. Good thing he was wearing glasses. "Okay , Coral, it is time to go downstairs so Mommy can run on the treadmill. " she says "Sounds good Hoser." HELLOOO! What three year old girl calls her mom a hoser? I guess one whose dad is Jaren. I told her from now on Daddy is the only hoser in the house and outside as well. Carson looked so cute here, I just had to share! He was almost smiling :). So, here's the finished product, who is that big girl in the picture? Anyway, if you can see past the big tum, you'll see Jaren did a great job on the chair rails. I tried to take some recent pictures, but for some reason our computer wouldn't download the pictures from our camera... I'll have to have Jaren look into that. Here's Jaren painting the room. I love it when Jaren has the day off, it is so fun to watch him play with Coral and Carson, he can always make either of them laugh so easily. I'm the Mom that's always worried about something-daddy is fun! I love to take Coral to the library to get new books to read. I especially like to go and get books for myself. I think I can probably find some time to read now that Carson is sleeping better. I love chocolate and pasta, those are probably my favorite things to eat. I also love Mom's scalloped potatoes and ham. I wish that was the Sunday tradition, but I also like Roast Beef. I really like exercising, but only with Jaren. We had a lot of fun training for the half marathon last year, and I am planning on doing it next year- just so you know Jaren! I am also looking forward to the Holidays, but mostly Christmas. Thanksgiving has been a little lame for me the last couple of years since Jaren always has to work. I am so glad Sarah and Nate are c0ming out for Christmas so I can finally hold little Cooper. It has been so long since the whole family has been together and I am also looking forward to Devon coming home from his mission in June. Coral really needs me right now to build something with play doh, this is most important, so I better go!! !